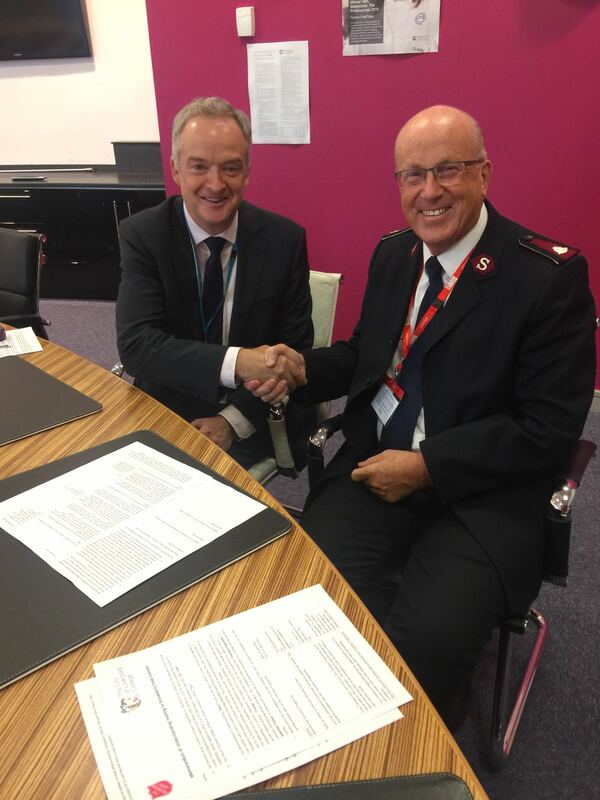 The Salvation Army and The City of Liverpool College have agreed a Memorandum of Understanding, committing to create and provide employment and training opportunities for young adults with learning disabilities. Simon Pierce, Vice Principal Curriculum at The City of Liverpool College and The Salvation Army’s Secretary for Mission Service on behalf of the UK and Republic of Ireland, Lieut-Colonel Alan Burns, have signed the Memorandum of Understanding (MoU), which is designed to bolster the strategic partnership between the two organisations. Over a million people in the UK have a learning disability* and only 7% of that number have a job. In addition 31% have no contact with family or friends, according to research uncovered by the Church and Charity. The Salvation Army firmly believes in opportunities for all and they are tackling issues within the community by redeveloping Strawberry Field, the former children’s home that inspired John Lennon’s famous song ‘ Strawberry Fields Forever’, into a new training and work placement hub to meet the local need in Liverpool. The Steps to Work scheme launches in October 2018 and offers young adults with mild to moderate learning disabilities the opportunity to gain skills and work experience, supporting them into employment. The structured programme comprises classroom-based life skills learning, specialised sector training and work experience giving trainees the chance to develop their employability and prepare to look for paid employment. Young adults will have the chance to gain certified qualifications through academic partnerships with local colleges. The City of Liverpool College is the first education and learning institution to partner with The Salvation Army Steps to Work programme. The signed MoU encompasses several areas of educational collaboration ranging from the training courses offered to help providing work placements for the trainees. Mr Pierce said: “The Salvation Army’s vision to re-develop Strawberry Field in such an innovative way, which gives job opportunities to young adults with learning disabilities, is wonderful. Today is the start of a new and exciting relationship between our organisations to deliver the training courses through which students will gain sector knowledge and skills, which they can put into practice in a business environment with local employers. “As the largest college in Liverpool City Region, we work with many charitable organisations, supporting the fantastic work that they do. We’re incredibly proud of our partnership with the Salvation Army. Our students are at the heart of everything we do and this cause in particular is one that is close to our hearts, as it provides our students with learning disabilities with an excellent opportunity to build a career for themselves once they leave college. Trainees who complete the educational stage of the programme will become graduates of The City of Liverpool College and of the Strawberry Field centre. Who is Britain’s Most Inclusive Employer?